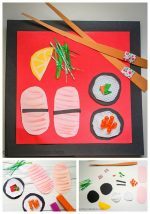 Of all the crafts that kids can do, one of the easiest is a paper collage. 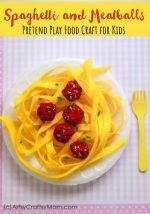 It’s so easy, even toddlers can try their hand at it!! 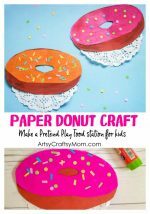 All you need is a big sheet of plain paper, lots of colored paper and of course, glue!! The best part is that you can make it as simple or as detailed as you like – the options are endless!! 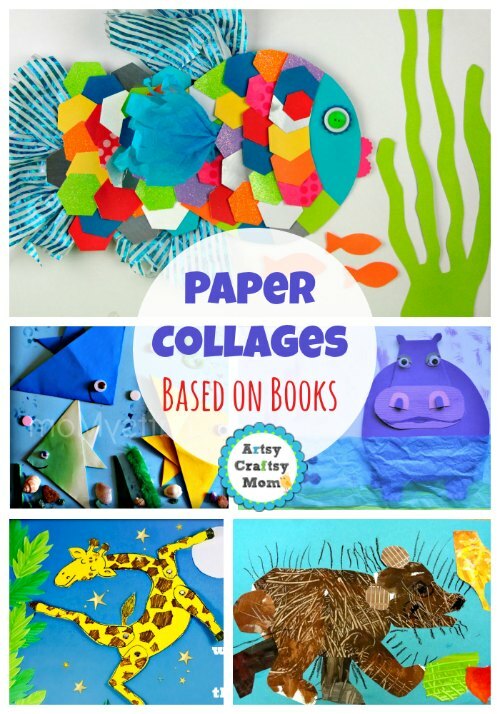 Speaking of endless, there is a HUGE variety of paper collage crafts out there for kids of all ages, so we’ve selected the best of the lot and included a good variety right here. Check them out – we promise you’ll be tempted to sit down with lots of paper and a big bottle of glue! 1. These colorful popsicles from Tiny Rotten Peanuts are perfect for summer – so juicy and fruity! 2. 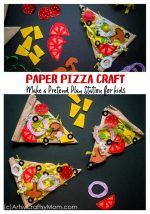 Customize the toppings to your liking on this super delicious pizza made of paper. Idea via Mrs. Brown Art. 3. Everyone has their own favorite burger layers – show yours in this cool burger collage from Kinder Art! 4. 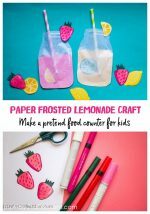 Make these cute cupcakes with an assortment of colored and patterned paper and make as many as you like! Idea via Laugh Paint Create. 6. Who knew cupcake liners would make such adorable umbrellas on a rainy day? 7. Where would you like to wake up tomorrow, ask the folks at Krokotak? Show us the view from your window! 8. Use paper of different textures to make this detailed farm scene – complete with tractor! 9. A city by the river should feature not just buildings, but boats too! 10. Speaking of boats, try out this impressive collage by Molly Moo Crafts, of boats at sea. 11. Ensure your vehicles follow all traffic rules in this road scene collage craft by Study for Common Things. 12. Why stick to roads when you can go to outer space too? Pink and Green Mama has used paper painted with planet-like effects. 13. You often see beautiful scenery when you travel in trains like in this collage craft by Gallery Edge. 14. We’ve done a farm with farm animals; now’s the turn of our forest friends! Idea via First Palette. 15. Cities take on a different look in winters; capture that effect in a lovely winter scene collage, as shown in Krokotak! 16. Make this beautiful collage of a flower bouquet and try ones in different colors. Idea via Painted Paper in the Art Room. 17. Collages can be 3 dimensional as well, like these ladybugs by Crafty Morning! 18. Use tissue paper in autumn colors like green and brown for this gorgeous autumn tree from The Frugal Crafter. 19. This fish is surprisingly easy to make; just use a circle punch for the scales. Idea via Art Class Ideas. 20. 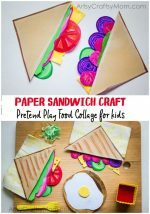 Try different patterned papers in red for this interesting take on an apple collage from Little Family Fun. 21. Make this adorable octopus from I Heart Crafty Things with crepe paper for tentacles. 22. At Krokotak, they’ve used different geometric shapes to make this cute little black cat. 23. Try sponge painting for the background and then stick on paper for this realistic underwater scene from Ric Group. 24. At Activity Village, different paper textures come together for this bird’s nest. 26. Celebrate India’s iconic Republic Day Air Show with this glitter and paper collage. 27. How adorable are these penguins at Deep Space Sparkle? Dress them up differently in funky costumes! 28. Make ‘Fall’ really look like it with these falling autumn leaves collage from Finally In First. 29. Snow creates a magical look for winter, as in this winter scape collage. 30. One of the simplest crafts in this list, this Christmas tree from Rudy and the Dodo is easy for even toddlers to make. 31. Spook up your Halloween with these cupcake liner bats from I Heart Crafty Things. 32. No Valentine is complete without a heart; make it more interesting with a butterfly heart collage as in My Pretty Way of Life. 34. Got lots of magazines lying around? Learn how to make this magazine scrap Santa at I Heart Crafty Things. 35. Get lots of black paper and scary embellishments for a Halloween special collage at Kitchen Floor Crafts. 36. Make this movable giraffe collage based on the book, ‘Giraffes can’t Dance‘. 37. The popular book, ‘The Hungry Caterpillar‘, comes to life in caterpillar collage form at The Imagination Tree. 39. Mary Making makes sure these kites don’t fly away to ‘Attic of the Wind‘. 40. ‘The Hiccupotamus‘ is having a field day standing in water at I Heart Crafty Things. 41. You can change this monster’s expression to sad or glad, based on the book ‘Glad Monster Sad Monster‘. Idea via Artsonia. 42. Use old magazines to make the several mattresses in this ‘Princess and the Pea‘ collage from Art Class Ideas. 44. Enjoy ‘The Rainbow Fish‘ with a rainbow fish collage of your own, as shown by Fiskers! 45. A colorful chameleon craft based on Eric Carle’s ‘The Mixed Up Chameleon‘ at The Way of Art. 46. Make your initial in a color of your choice and use a complementary color for the background. Idea via Dali Moustache. 47. Family trees are always fun to make, and this one is easy too! 48. Make a self portrait, including all the details like hair, eyes and clothes, like they’ve done at The Talking Walls Murals. 50. Sometimes, it’s nice to just fly high, with the help of some balloons like in Handmade Kids Art! 51. Make this Kandinsky-inspired circle collage craft using a variety of colors, like in Happiness is Homemade. 52. Punch out circles from different colored and patterned paper for this amazingly simple circle collage art from White Wall Gallery. 54. Channel Picasso in a face collage with features cut from magazines, as shown by Dada Enfant Terrible! 55. Give your paper collage a Laurent feel by using bright colored paper and oil paints on a black background. Idea via Our Art Lately. 56. Make this geometric collage, inspired by Paul Klee’s Castle and the Sun, as shown by Use Your Colored Pencils. 57. Go the Andy Warhol way by making this retro themed collage from Domestic Goddessque. 58. All art begins with the color wheel, so use scrap paper to give it an extra edge. Idea via MVRM Art Room. 59. Van Gogh’s Starry Night gets a new impression in this collage art with a paint background. Idea via Art is What I Teach. 60. Do as Wilder Paint Splatters has done and use Matisse for inspiration to create this fish bowl collage. 61. Make a bare wall interesting with some giant collage flowers as done in Buggy and Buddy. 62. Use up the space under the ceiling with this birds on a wire collage from La Cloche a Sonne. 63. Filth Wizardry covers a boring window with a colored paper collage for a breathtaking effect. 64. Welcome autumn with this leaf window collage from Inner Child Fun. 65. Garden of Praise has gone all the way to adorn a long and boring hallway with a neighborhood collage. 66. If you’re an Eric Carle fan, use up an empty wall with this Carleville collage in pleasing colors. Idea via Carle Museum. 67. Cut, glue and apply mod podge. Cool Wall Art Idea to use cut paper Wasn’t that an easy DIY wall art project? 68. Milestones and cute pictures come together in this circular photo collage by The Berry on a blank wall. 69. During winter, make a mural celebrating the snowy season with penguins and polar bears. Idea via Gallery 2404. 70. Add loads of cheer to a room with this simple yet beautiful rainbow collage from Krokotak. Thanks so much for including the Andy Warhol. We loved making it!